Color Explorers in the Classroom is a collaborative effort of educators, designers and manufacturers to create a new product line and color curriculum for use in Pre-K to Grade 8 classrooms. Our shared goal is to transform how color is taught in the 21st Century. Color Explorers in the Classroom was founded by Maggie Maggio of Smashing Color. 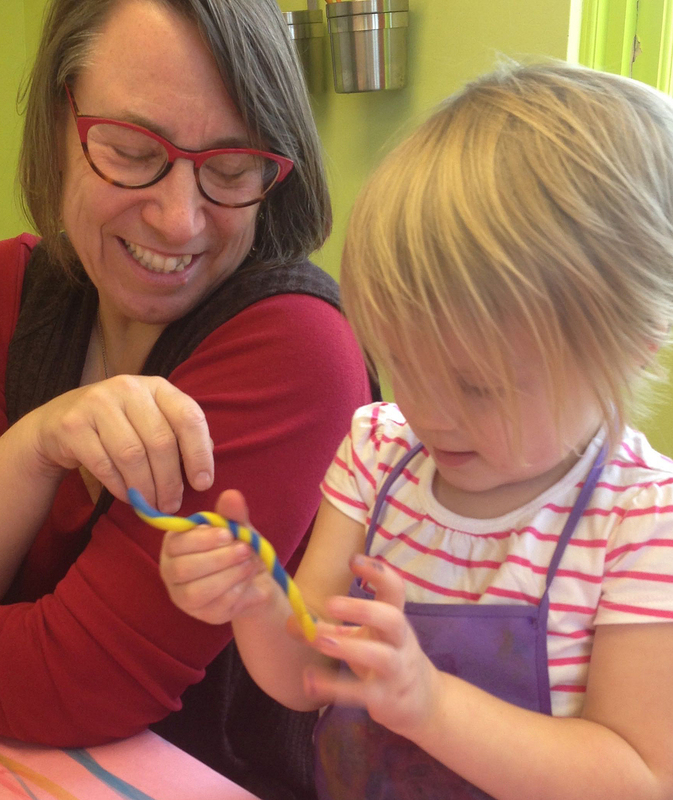 After 25 years of teaching adults about color using the Cyan-Magenta-Yellow primaries, Maggie decided it was time to introduce kids to the modern color mixing system. Maggie cares deeply about giving kids what they need to feel successful and creative in the classroom. Providing students with a 21st Century Color Curriculum will empower them to explore color in both art and science, building a strong foundation for understanding how color works. Mixing cyan and yellow with polymer clay. Having fun in the first VIBE Art Studio! Coloring Cyanosaurus Rex and his buddies. Why should classrooms transition to Cyan-Magenta-Yellow primaries? We all grew up learning that Red, Yellow, and Blue (RYB) are the primary colors. It's one of the very first concepts that children encounter in early education. But... you may remember going to art class and trying to mix paints for the first time. You combined red and blue to make purple, but instead you got mud. What gives?! These confusing results often lead kids to think they messed up, failed, or are just plain "bad at art." This misperception turns many kids away from art before they've hardly even begun. These kids aren't doing anything wrong — they're working with inaccurate information. The RYB color theory worked well for artists for centuries, but it's time to evolve and take advantage of advances in science and technology. With the growing use of computers in art, it's becoming even more critical to learn both analog and digital color. We can start by teaching both the science and art of color and help students explore the interconnected relationship between light and pigment. In order to do that, we need to start introducing them to the modern primary colors of Cyan, Magenta, and Yellow (CMY). The majority of schools in the United States still teach the classic primary colors of the 18th century - Red, Yellow and Blue. With modern advances in the science of color, it's time to empower the creativity of our children by teaching 21st Century Color. Even though parents and teachers may want to teach using CMY, they simply do not have the time or resources to create an entirely new line of educational materials to supplement their stock of traditional RYB materials. That is where our project comes in. We are calling for an all-out effort of teachers, designers, and manufacturers to work together to provide affordable educational materials for teaching and exploring modern color. It's time to integrate the systems of light and pigment. It's time to bring color education into the 21st Century.